Alright, time for the first installment of the new beers I tried on the recent trip to Las Vegas for Dustin's bachelor party. Sorry, no bachelor party stories in this webspace... maybe check Brent's facebook? Our first stop (after spending the night in New Orleans) was actually in the Salt Lake City airport, at a place called Squatters Pub. The brewery opened in 1989 and now they run 3 locations... the original in Salt Lake City, a location in Park City, and a location in the airport. And for an airport pub the selection was really not bad. They had a wide range of the standard beers plus bottles of some of the specialties. 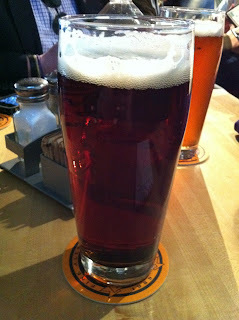 First up was the Squatters Organic Amber Ale. 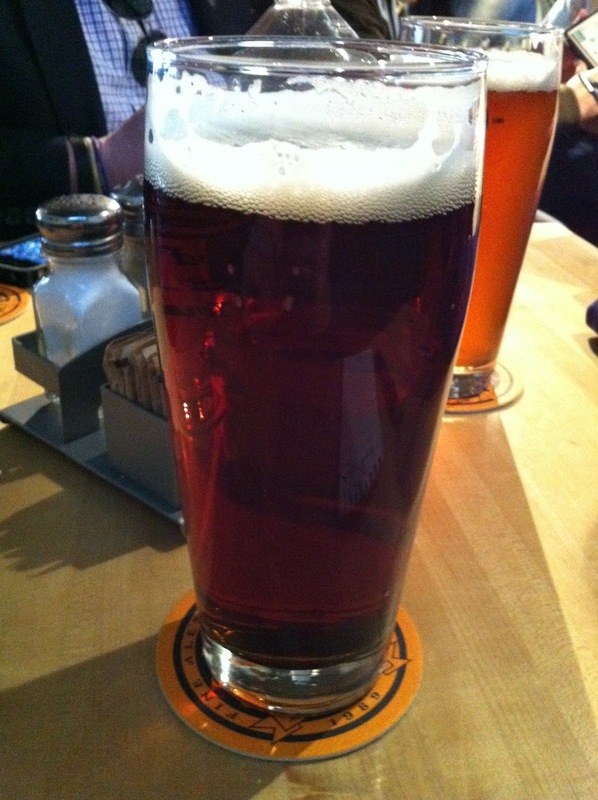 It's a pretty typical looking amber ale served in an imperial pint glass. Dark caramel color with a small white head, but on a bar pour you don't really want a large head, right? The aroma is malt dominant as it should be, but with a nice hint of hops. It has a good balance on the nose for sure. Unfortunately the taste was a little weak compared to the smell, the same flavors but watered down. It has a bitter hop hit on the aftertaste, but still an easy-drinking amber ale. 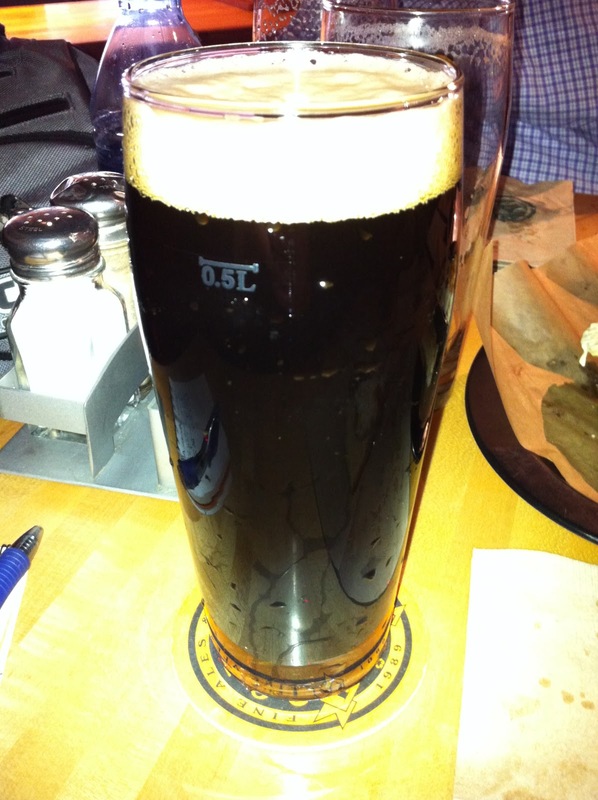 The second beer I tried from Squatters was the fantastically named Polygamy Porter. Thanks for not taking yourselves too seriously, guys! Although, I'm sure since they are brewers the guys running the show at Squatters probably aren't Mormon? It's also worth noting that these beers are full strength, not 3.2% alcohol. As you can see it's a dark brown, nearly black, color with a decent sized head. Good looking beer, and a solid aroma of chocolate and roasted malts. The taste is a lot like the amber ale... just weak compared to the nose. The roasted malt flavors are still there but it's watery and really thing for a porter. Another easy drinker, but not super impressive. 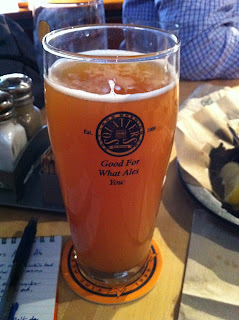 Third on the list was another beer from their regular rotation, the American Wheat Hefeweizen. This one really has a good look to it, beautiful orange color and haziness. Definitely the best looking beer I've had from Squatters so far. The smell is mostly citrus, a little banana, very nice. The flavor is definitely heavy on the wheat, with a milder citric profile than the nose. A little weaker than I was hoping, but this seems to be the trend so far. Even still, this one was easy to drink, tasted good... my favorite from Squatters so far. Apparently I like this one better than the masses! 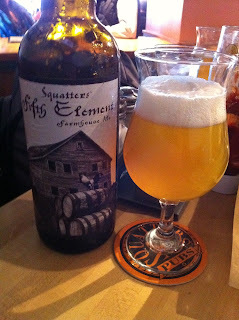 Last up, Buzz and I decided to split one of the special release beers, the Squatters Fifth Element Belgian Farmhouse Ale. Split, you ask? Yeah, because it's a 750ml bottle and costs $18.99, I have no problems splitting a beer. This one even came with some proper glassware, props to the airport pub for serving it correctly! 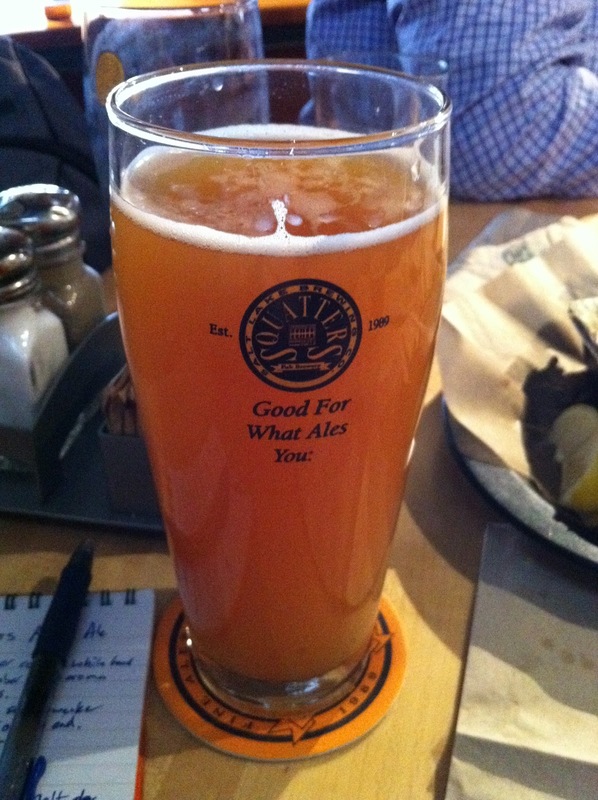 As you can see, it's a hazy golden color with a bubbly white head and lots of carbonation. The aroma is very floral, with hints of honey and lots of spices. The taste is even more floral and spicy, with a little hops and a dominant sour flavor to it. This Fifth Element is a really good beer, the best yet from Squatters, but I'm glad I split it because it would be tough to drink an entire 750ml bottle by myself. And with that, I was up to 9 new beers on my quest to try 365 new beers in 2011, and we were on the plane headed to Vegas... and Part 2 of my beer drinking portion of the weekend. Cheers! Way to get drunk in the airport. You were drunk when we got TO the airport.